Southwestern Vermont is characterized by rolling hills, fertile farmlands, and deep valleys, nestled between two mountain ranges — the Taconics to the east and the Green Mountains to the west. My family and I have lived and played in Southern Vermont for the past 10 years. We were initially drawn to its natural beauty, but fell in love with the charming villages, friendly people, and fun attractions. Bennington County is unique because it has two county seats, or shires — Bennington and Manchester— each with its own unique personality, cultural significance, and visitor appeal. The towns are separated by 28 miles of iconic Vermont scenery on the Shires of Vermont Byway. The Shires of Vermont, and the quaint villages along the byway (route 7A), are the perfect destination for a relaxing and fun-filled family getaway. Here are some of the highlights of a Shires of Vermont family vacation. Bennington sits in the southwest corner of the Green Mountain State. By national standards, it’s a small town, but with just over 15,000 people, it’s one of the larger communities in the state. The town was chartered in 1749, and is probably best known for its role in the Revolutionary War. Bennington includes three distinct communities — historic Old Bennington, North Bennington, and a bustling downtown area. Here are the must-visit attractions for families in Bennington, Vermont. Located in beautiful Old Bennington, the Bennington Museum is renowned for its curated collection of art and history from the northeast. It holds the largest public collection of Grandma Moses paintings in the US, as well as one of the oldest “Stars and Stripes” flags in existence. Kids will enjoy a visit to the Grandma Moses Schoolhouse, where they can take part in a myriad of hands-on activities from days gone by, including needlecraft, colonial games and crafts, and dress up. Grandma Moses attended the small schoolhouse as a child in Eagle Bridge, New York. It was moved to the Bennington Museum in 1972. Details: The Bennington Museum is open from Thursday to Tuesday, 10am – 5pm. Cost for admission is $10. Children under 17 are always free. Need a place to stay? I like Kimpton Taconic Hotel in Manchester. Click the link to check rates and reviews now on TripAdvisor. While you’re in old Bennington, you won’t want to miss a tour of the Bennington Battle Monument. In fact, you can walk to the monument from the museum. At 306 feet, the Bennington Monument is the tallest building in the state. It’s the most popular of all Vermont state historic sites, and the views from the top are spectacular. Visitors can ride to the top in an elevator from mid-April unitl October 31st from 9 am to 5 pm. Learn all about Bennington’s place in the Revolutionary War and be sure to have a picnic on the lawn. Details: The Bennington Battle Monument is open from 9am – 5pm every day, from mid April through October 31. Cost is $5 for adults, and $1 for kids age 6-14. Children under 5 are free. Located right on Main Street in Bennington’s downtown shopping and dining district, Oldcastle theatre has infused downtown with new life and artistic flair. The professional theatre company is celebrating 45 years on stage, with a full line-up of world-class productions starting in May and running through October 15th. While not all of the shows are child-friendly, the theatre also hosts a variety of special events throughout the season. Details: Oldcastle Theatre is located on Main Street in downtown Bennington. For an updated calendar and ticket information, please visit their website. A Bennington road trip wouldn’t be complete without a hike through the fields and forests of this beautiful landscape. The Mile Around Woods trail is an easy mile loop through a working farm and a mature hardwood forest. 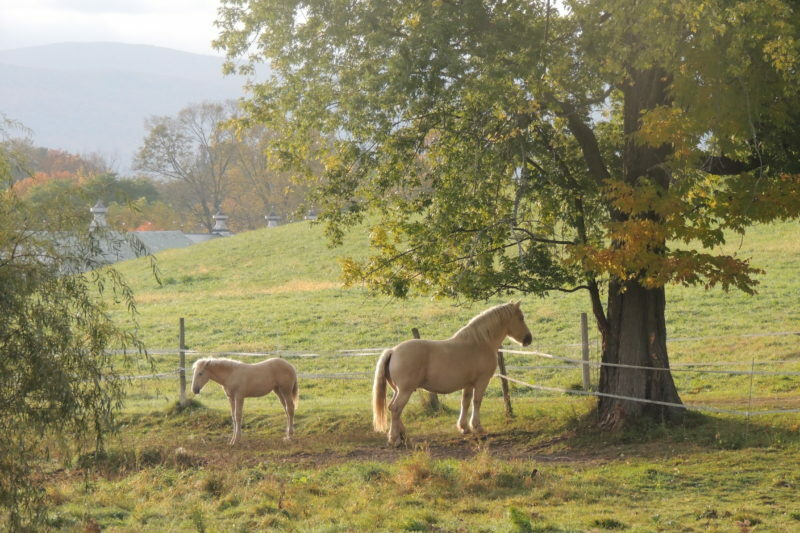 The views are spectacular, and kids of all ages will enjoy watching the draft horses, scrambling on boulders, and playing hide and seek in the woods. Sunset is especially lovely — the perfect end to a perfect Vermont day. Want to learn more about family-friendly hikes in Southern Vermont? Check out our Southern Vermont trail guide on Back Road Ramblers. Details: Mile Around the Woods is located behind the historic Park McCullough House on McCullough Road. Drive past the house and you will see a small parking area on the right. Follow the farm road to the trail. For more information, visit the Fund for North Bennington. Manchester is lucky enough to be situated near two Green Mountain ski resorts, making it a tourist hub for winter enthusiasts. While ski season may be hoppin’, the other three seasons are just as lovely, with pastoral scenery, quaint village architecture, designer shops, and a thriving local arts scene. It’s long been a summer getaway for city folk from New York and Boston, and it’s a perfect destination for families looking for a good mix of fun and relaxation. This Georgian Revival mansion was built in 1905 by Robert Todd Lincoln, son of President Abraham Lincoln. Don’t let the idea of visiting a historic house with your family keep you from visiting. Hildene is an incredible place for families with kids! Yes, there are rooms full of antique furniture and meticulous gardens full of heirloom plants, but there is also a restored Pullman Palace train car to explore, a working dairy farm, and 12 miles of walking trails. The sprawling grounds were meant for frolicking children, and the house has been meticulously restored. Details: Hildene is open daily from 9:30 to 4:30. Admission is $20 for adults and $5 for kids. Children under six are admitted free. At 3,848 feet, Mt. Equinox is the tallest mountain in the Taconic range, towering over Manchester and the surrounding valley. You can reach the summit of Mt. Equinox by hiking a steep, 3.1-mile trail in the Equinox Preserve, or you can pay a toll and drive up Skyline Drive for unsurpassed views in a matter of minutes. The road is closed in the winter, and can be accessed from route 7A in Sunderland. From the parking lot at the top of the mountain, it’s a short, .2 mile hike to Lookout Rock, where you’ll have a perfect view of Manchester and the Green Mountains. Details: Skyline Drive is open from late May through October. Cost is $15 for car and driver, and $5 for extra passengers. Children are free. If shopping is your favorite way to relax on vacation, then Manchester won’t disappoint. With more than 40 designer outlet stores to choose from, Manchester has been called, “one of the top shopping destinations in New England,” by Yankee Magazine. Iconic brands represented in Manchester, include J. Crew, Eddie Bauer, New Balance, Brooks Brothers, and Kate Spade. What could be better than a little retail therapy in the mountains? Details: For a detailed map and an overview of Manchester Designer Outlet stores, visit the MDO website. Looking for airfare? Albany International is the nearest airport. Find the lowest prices on flights with AirfareWatchdog or Google Flights, then book directly through the airline. Find out why HERE. Need a place to stay? We recommend the Wilburton Inn or Kimpton Taconic Hotel in Manchester. Booking a vacation rental through HomeAway is also a good option. Read Katie’s tips for booking a great family vacation rental HERE. Need a rental car? Driving your own car is the best way to get around the Shires of Vermont. Find the best rates from dozens of agencies at RentalCars.com. Want more ideas for your Vermont vacation? Check out Tips for Family Trips’ New England for Families board on Pinterest. Tara is a freelance writer and travel blogger with a passion for outdoor adventures. She currently blogs at Back Road Ramblers, where she shares travel tips, adventure destinations, and family vacation ideas for the wanderer in everyone. Her goal is to help families connect with the world and each other by stepping out their front door and embarking on journeys big and small. Thank you Tara for this beautiful post.